Well, Merry Christmas, Life Bridge! … and a happy new year. I hope everyone had a wonderful Christmas. One of our family traditions is watching Christmas movies. We watch certain classics every year, and others occasionally fill in the gaps between them. I know Pastor Boerman has been asking people what their favorite Christmas movies are, so I thought I’d do a little informal post-Christmas survey. I’m going to show a few well-loved movie stills on the screen. If you know the name of the movie (and love it), shout it out. This one’s my favorite! Note that every other movie on this list is A story about something. But this is THE nativity story. In any event, clearly there is something about this story captures the imagination and is well-loved by millions. Charles Dickens completed his famous book, A Christmas Carol, in England in December of 1843, printing and distributing the first copies just a few days before Christmas that year. He called his story “A Christmas Carol,” because he expected the story to be often shared, to spread joy and to bring people together, just as singing Christmas carols do. 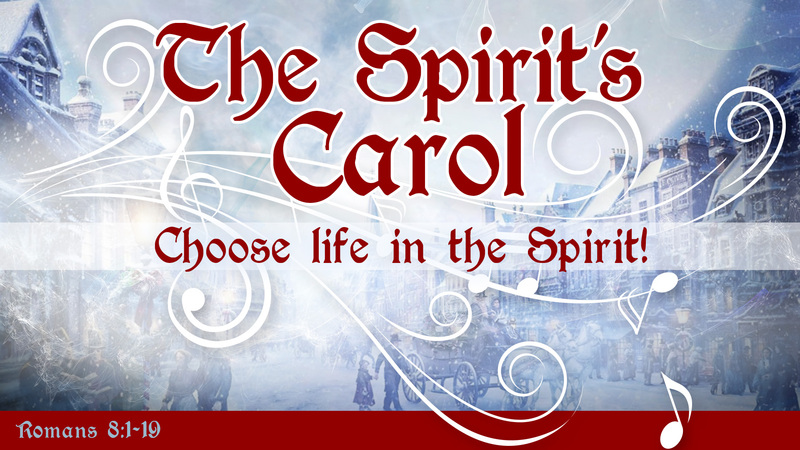 To Dickens, his “carol” was a song of praise for the Christmas season and for the redemption of Ebenezer Scrooge, his story’s protagonist. 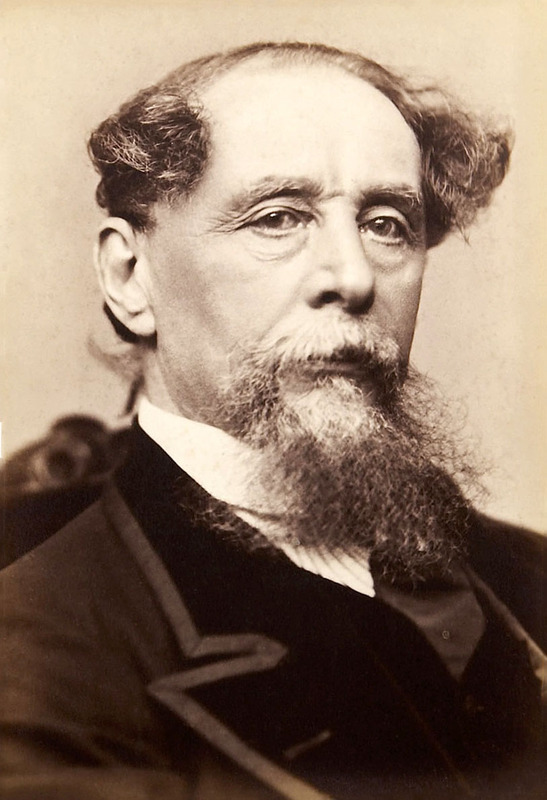 Dickens even called the five chapters of his book “staves” (or “stanzas“). A musical stave is a section of a piece of music with a consistent theme and mood. Each stave has its own focus and can stand alone, but each also contributes to the overall theme of the song. And so it is in Dickens’ story. I bring all this up, because I see many of the same qualities in our passage today. Both Dickens’ story and our passage are beautiful stories of redemption. Both are meant to be repeated often, to bring people together, and to be a tremendous source of joy. The passage we’re looking at today is Romans 8:1-19. It’s situated at the heart of the book of Romans – the climactic chapter of one of the greatest theological works ever written. And like Dickens’ inveterate tail about the redemption of Ebenezer Scrooge, this passage about our redemption can, I believe, be analyzed in five staves. So, let’s pray and ask God to teach us in this time, and then dive in together. Heavenly Father, you alone are glorious and sovereign over this world. In you we find all truth, all goodness and all beauty. Everywhere we look, we see your grace, your provision, and your covenantal faithfulness to your people. But nowhere is your brilliant glory better seen than in your work of redemption … your reckless love for us and your active work to reconcile and restore us, who are so unworthy of that love. For those of us who have experienced your mercy first hand, we are lost in wonder and praise. But there may be those listening to me right now who have never tasted and have not seen how marvelous you are, who do not know you, who may not be able to relate to even my feeble description of your beauty. Pour out your Spirit on this place today, Lord. Open our eyes that we might see you. And our ears, that we might hear. Open our hearts, that we might rightly understand and truly receive your word. Open our hands, that we might release anything that would stand in the way of radical obedience and total submission to you, whom to know is life itself. And open our mouths, Lord, that our lips would pour forth your praise. Now, Father, I ask that your word would go forth in power today and would not return void, but would accomplish the purpose for which you have sent it out. In these next few minutes, we would see Jesus and Him only. And it’s in His name that we pray. 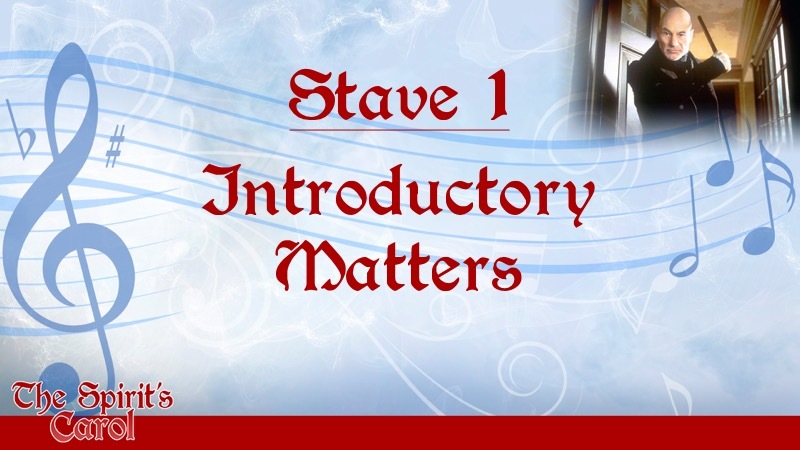 Okay, I’m calling stave 1 of this message “Introductory matters.” Because I’m kindof a huge nerd, before we dive into the Scriptures, I’d like to take a few minutes to define a couple terms and do a little table setting together. I know this is going to shock most of you, but I’d like to teach you two Greek words: πνεῦμα [phonetically: “neuma”] and σάρξ [“sarx”]. 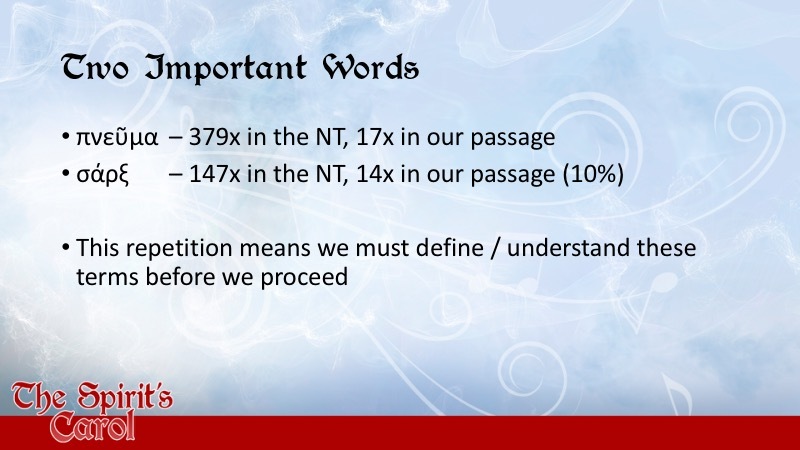 As you can see by the stats on the screen , these concepts were clearly dominating Paul’s thoughts as he wrote this chapter of his letter. And that means it’s important for us to understand these words before we proceed. The first, πνεῦμα, you probably already know. 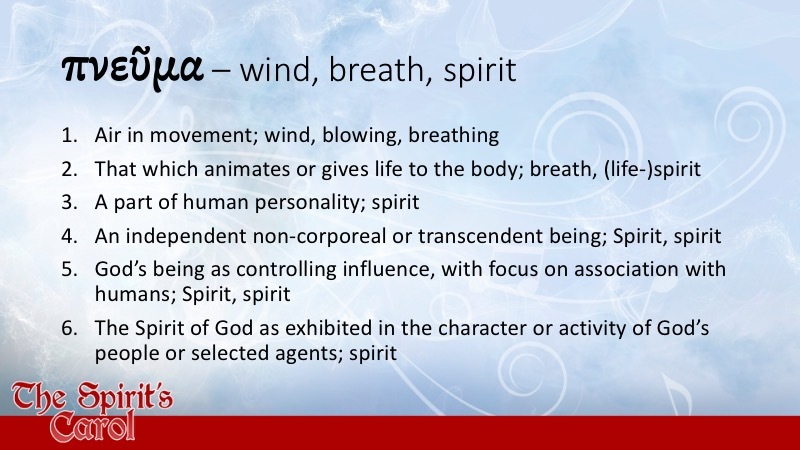 It is a word that can mean a natural wind or the breath of a living being, but it is most often translated “spirit.” It can represent the spirit of a person or of God Himself, or it can mean an angel or demon (good or evil spirits). I’ve listed on the screen the most common definitions of the word from BDAG, the leading academic Greek-English lexicon of the New Testament. The second word, σάρξ, may be less familiar. It too can mean several things, and I’ve put common definitions on the screen . 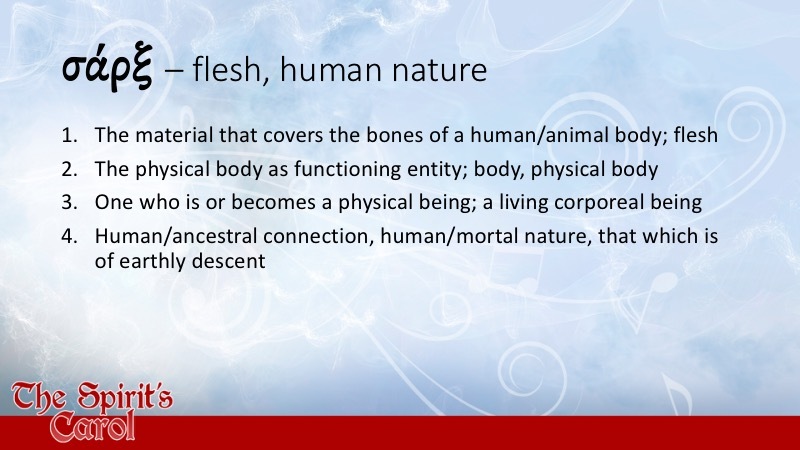 Most prominently, it can mean “flesh,” as in, the meat on the bones of a person or other animal. But it can also refer to our nature as human beings. So, in what sense is Paul using these terms in our passage? 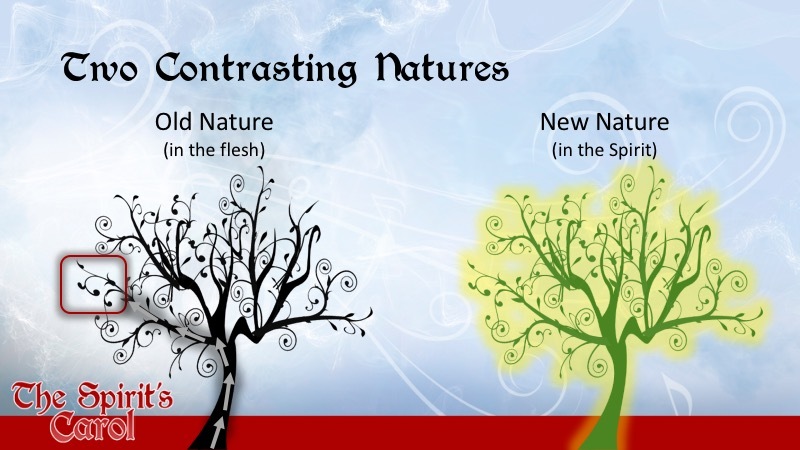 When we look at the text, it will become clear that Paul sees these two terms as contrasting with one another, and he clearly sees “the spirit” as more desirable than “the flesh.” But when he makes this contrast, both here and elsewhere, he is often misunderstood to be contrasting the physical body, which is bad, and a non-physical spirit (somehow contained within the body), which is good. Neither is σάρξ inherently evil, nor is πνεῦμα inherently good. Instead, I would like to propose that we think of Paul’s use of σάρξ and πνεῦμα as a euphemism for two contrasting natures. In this passage, σάρξ might best be translated, at least for most usages, as “human nature” or “the natural, unregenerate life of a human being,” and πνεῦμα refers to a fundamentally different kind of nature which is offered to us in Jesus. Paul invests a ton of energy in Romans to describe this new life to us. So, I want to quickly construct a word picture related to these contrasting natures, which will serve as a framework for us as we work through our passage today. When God created humankind, He gave us a particular nature. We are created as finite, physical beings, made in the image of God. As a race, we share the same nature. We are all the same kind of being. Think of this as a particular type of vine planted in a particular type of soil. All of us, as individual human beings, are members of this shared human nature. We are branches on the vine, sharing its fundamental nature and a particular kind of life. But “all have sinned and fall short of the glory of God” (Rom 3:23). Therefore, our fundamental nature has become corrupt. So, the soil in which our vine is planted has been irrevocably poisoned, and the vine of our nature is dying. Each of us branches is now sharing a corrupted, perishing, temporary life … life that is decaying and fading away. This vine is our σάρξ. It’s the human nature that we all share. 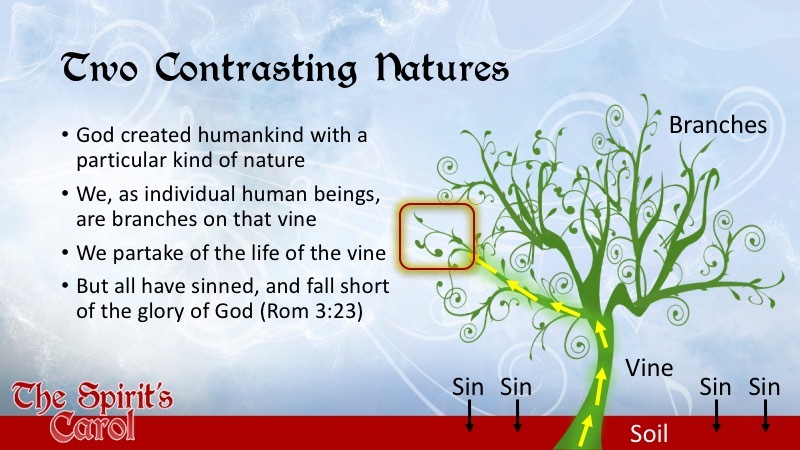 There was nothing wrong with our natures, nothing wrong with this vine, when God created it. In fact, it was “very good.” But we have poisoned the soil, so any branch remaining in this withering vine now marches inexorably toward death. But, unwilling to let us die, God Himself – the Eternal Son, the second person of the Trinity – stepped into human history and became a man. In this mysterious union of Jesus’ full divinity and full humanity, a new nature was created – new soil and a new vine. And this soil cannot be poisoned and this vine cannot be corrupted. It will never perish, never fade, never die. 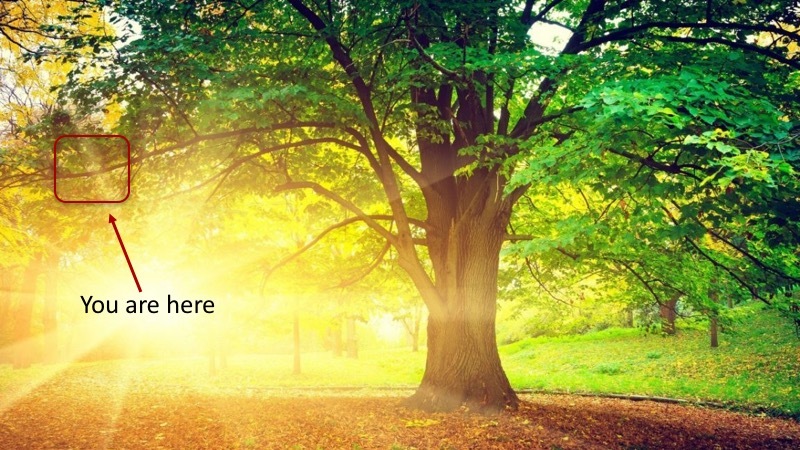 The divine life of the Spirit of God pulses through it, fully able to bring life to all its branches for all eternity. And so, we have a problem, because all of us by nature are members of a corrupted, withered, perishing vine. And we have in ourselves no power to move over to the vine where eternal life can be found. To quote the last verses of Romans 7, immediately preceding our passage, “Wretched people that we are, who will deliver us from this body of death?” If we could only somehow find life in this new vine! What we really need is a savior … someone to rescue us from this dying vine, and grant us access to the life of this new vine. And that is the work of the Son of God and the “carol” of the Spirit of God … which brings us to our passage today. So then, brothers [and sisters], we are debtors, not to the flesh, to live according to the flesh. For if you live according to the flesh, you will die, but if by the Spirit you put to death the deeds of the body, you will live. For all who are led by the Spirit of God are sons [and daughters] of God. For you did not receive the spirit of slavery to fall back into fear, but you have received the Spirit of adoption as [children], by whom we cry, “Abba! Father!” The Spirit Himself bears witness with our spirit that we are children of God, and if children, then heirs – heirs of God and fellow heirs with Christ, provided we suffer with Him, in order that we may also be glorified with Him. For I consider that the sufferings of this present time are not worth comparing with the glory that is to be revealed to us. For the creation waits with eager longing for the revealing of the [children] of God. Now, let’s see if we can unpack this a little. Since Adam and Eve fell in the garden, every person born into this world has been born into slavery. Each one of us begins life trapped, having the power only to act within the confines of our sinful human nature – to gratify the desires of the flesh. Like a broken clock, which is right twice a day, we would occasionally get something right, but in any sustainable sense, we were incapable of pleasing God. And this makes sense, given that we are branches growing on a corrupted vine. All branches are “slaves” to the vine on which they grow. The kind of life the vine provides – good or bad, corruptible or incorruptible – is all the branches have access to. So, if our nature is corrupted and sinful, then our actions will also be corrupted and sinful. It’s not a question of whether or not we want to do good; we can’t do good, because sinfulness is our natural corrupted state and the limit of our nature’s imagination. The unregenerate human being is a slave to sin, and slavery to sin doesn’t end well. Just a few pages before our passage, Paul makes the bold statement that “the wages of sin is death” (Rom 6:23). This means that when we sin, we are earning death in exactly the same way you earn your salary at your job. When you perform a day’s labor, your employer is morally obligated to pay you the appropriate wage for that work. Similarly, when we live our lives apart from Christ, we cannot help but to sin, and God, therefore, is morally obligated to pay us the wage for that sin – namely, death. 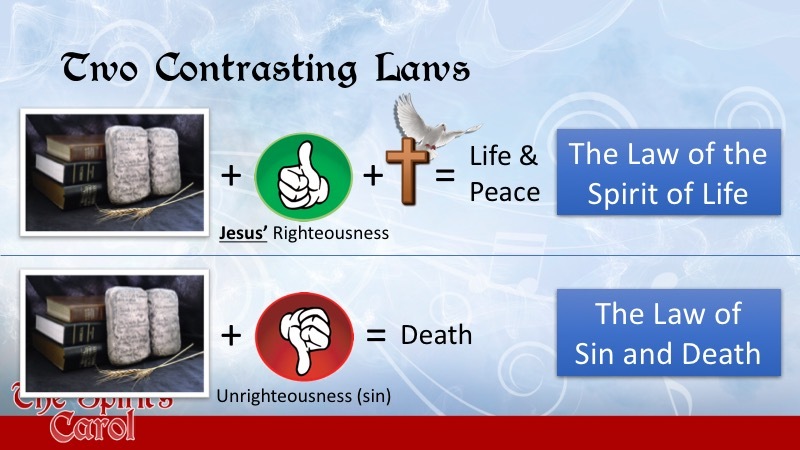 This is the law of sin and death, which Paul references in v2 of our passage. But what exactly is this law? Is Paul talking about the Mosaic law here? And if this law brings death, then is Paul saying that God’s law is somehow wrong or bad or to blame for the death that results from my sin? Yes, Paul is, in part, talking about the Mosaic law, and no, the law of God is absolutely not wrong or bad. In fact, God’s law is perfect and glorious. Paul spends considerable time working through these kinds of questions in the preceding chapters of Romans. I find his argument to be fairly complicated at points, and we don’t have time to go through it in detail, but let me try to summarize it quickly with a couple slides that might help. Essentially, it’s not God’s law that’s bad, it’s sin that’s bad. God’s law originates in God’s nature. He communicated that nature – God’s character and will – to His creation in His law, so that we can know how to live with a perfectly holy God. If we were to live in perfect conformity with God’s law – combining God’s law with perfect righteousness – then the result would be life and peace. But if we break God’s law – living against the grain of God’s character and will, and combining God’s law with unrighteousness (i.e. sin) – then the result is death. God’s law + righteousness = life and peace. 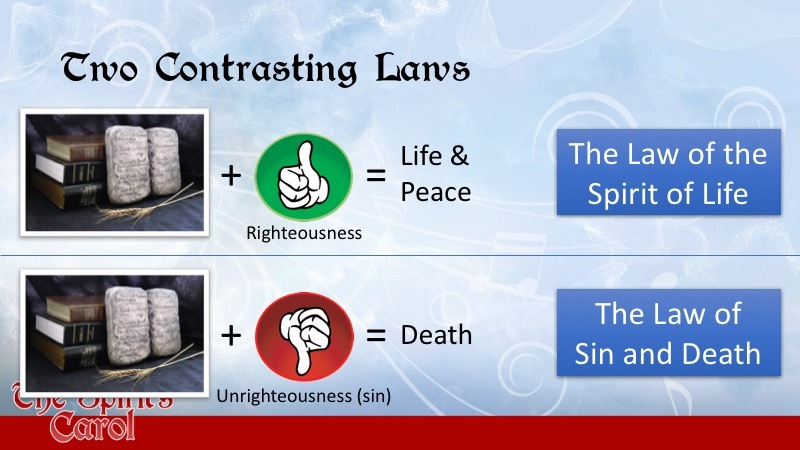 God’s law + sin = death. And so, we have Paul’s two opposing laws from verse 2… For Paul, “the law” refers to God’s law, perfect and beautiful, codified on Mount Sinai and expressed in His covenants. But “the law of sin and death” in our passage isn’t exactly the Mosaic law. It’s the result of mixing God’s law with our unrighteousness. Conversely, the “law of the Spirit of life” is the same law of God when it is perfectly fulfilled by a flawlessly righteous life … a life which we, manifestly, are incapable of living. If Jesus’ perfect righteousness were to go before us and fulfill God’s law in our place … and if the Spirit of God were to join us to Jesus’ new perfectly-righteous nature… then the law of the Spirit of Life could apply to us. And this is exactly what God did. He sent us Jesus, who did what we couldn’t do. So, our flesh was weak; we were unable to rise above our fallen human nature. But Jesus, became a man to create a new nature for us, as we’ve discussed, and died on the cross to atone for our sin. Jesus’ sacrifice on the cross establishes our innocence before God – “There is therefore now no condemnation for those who are in Christ Jesus!” –, but it does more than that. It condemns sin in the flesh. Sin is an enemy that God is in the process of destroying forever. All those who are transplanted into the new vine will live forever, and once the old vine has finished dying, sin will be no more. Conquered. Vanquished forever. In other words, God has made for us a new way and is leaving the old way to die. The righteous requirement of God’s law is that we be perfect just as God is perfect (c.f. Matt 5:48). And we are wholly incapable of fulfilling it on our own. Our only hope is that God would give us this righteousness as a gift of gracious love. And that’s exactly what He’s done in Jesus. We gain access to the perfect life that Jesus lived in our place, on our behalf, when the Holy Spirit transplants us into the vine where the law of the Spirit of Life reigns. This is what God has done for us in Jesus, through the Holy Spirit. This leads us to what the Spirit of God is doing now. Having established the possibility for new life, God the Son has sent to us His Spirit to transfer us into this new life, to literally dwell within us, and to cultivate is us a new life of righteousness. The Spirit of God is the One who actually transfers us from the old vine and grafts us onto the new one. 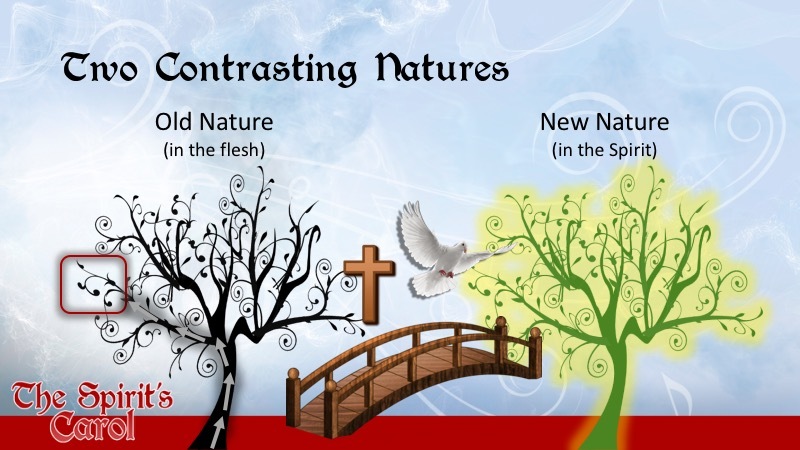 Theologians refer to this as our “union with Christ.” By the power and work of the Spirit of God, we leave our old nature behind and are joined with Christ’s new nature. Another metaphor Paul uses to describe this transfer, this fundamental change in our nature, is “adoption.” We are literally – in a spiritual sense that we can’t possibly fully understand – adopted into God’s family and become God’s children. This has all kinds of implications, a few of which we’ll talk about in a second, but perhaps the most important one is that the Spirit takes up residence in our hearts. Once we are grafted into Christ, the Spirit actively provides the life that flows from that vine, regenerating us and giving us new life. So, in a non-quantifiable-but-very-real way, anyone who accepts Jesus Christ as their Lord and Savior receives an entirely new kind of life. The Holy Spirit, the 3rd Person of the eternal Trinity, literally takes up residence inside that person and actively provides new life – life that is, in fact, eternal. But this isn’t just the promise of new life someday or what will happen after we die. It means a new life and a new nature right now! It’s a whole new way of living and thinking. 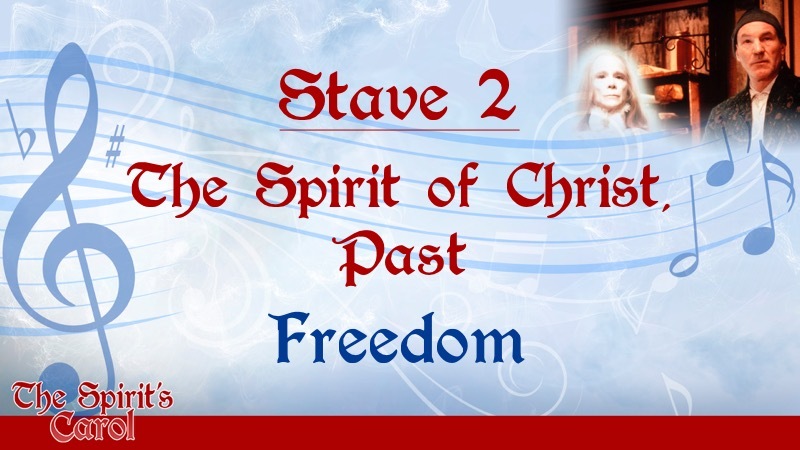 So, the law of the Spirit of Life has set us free, and now we can obey God’s law. But, Paul says in v12 that we are no longer debtors to the flesh, but we are still debtors. And then he leaves us hanging! To what or whom are we debtors? If you present yourselves to anyone as obedient slaves, you are slaves of the one whom you obey, either of sin, which leads to death, or of obedience, which leads to righteousness. But thanks be to God, that you who were once slaves of sin have become obedient … and, having been set free from sin, have become slaves of righteousness… For just as you once presented your members as slaves to impurity and to lawlessness leading to more lawlessness, so now present your members as slaves to righteousness leading to sanctification. So, we have been set free, but it is not absolute freedom. No finite creature is free in that sense. Only God has no limits. As finite, created beings, we will always have a master – either God Himself or an idol we put in God’s rightful place. So, it’s not a question of whether or not to serve a master, but of which master we will serve. If we are rooted in a corrupted human nature, we are slaves to sin. But if the Spirit of Life has set us free and transplanted us into a new nature, then the ability to choose righteousness becomes available to us. This is the freedom, the great opportunity, to serve that righteousness, which leads to eternal life, rather than of our sin, which leads to death. But that’s not all. Once growing on the new vine, the Spirit begins to actively change us to make us more like Jesus. As the graft takes hold, we should be getting stronger and stronger every day. Sin should be less attractive and more repulsive. Righteousness should be getting more and more natural to us. And someday, when we stand in glory in the very presence of God, we will finally and perfectly live lives of only righteousness, fully in accord with our incorruptible nature. This is why it was important to establish the contrast Paul is making in this chapter between flesh and spirit, to understand that he is not anticipating some kind of escape from our physical bodies. To the contrary, Paul is eagerly awaiting our physical, bodily resurrection from the dead. And so should we! When Jesus rose from the dead, He became the first of an entirely new humanity … not just in our nature, but physically in our individual bodies. It is our future to be raised bodily from the dead as Jesus was and to share in that new humanity, dwelling in the presence of God for eternity. 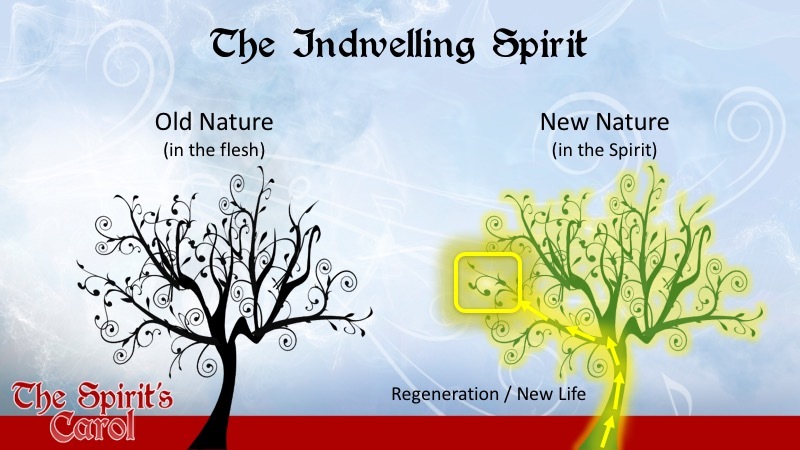 And as you can see in the text, it is the Spirit’s indwelling power which makes this new life possible. That is an amazing statement … that when He appears, we will be like Him. Note that this is exactly what Paul says at the end of our passage, in v19 … that “creation waits with eager longing for the revealing of the sons of God.” What we will be has not yet been revealed, but how glorious it will be when that revelation occurs. The very fabric of the universe groans in anticipation of that day … the day of our glorious resurrection, and also our glorious inheritance. So, we will have life because we have been adopted, and therefore we are sons and daughters rather than slaves to sin (8:2) and enemies of God (8:7). And if children, then heirs, but heirs of what? Heirs of glory! Heirs of the life available in the new vine. Heirs of the very presence of God. Heirs of being made like Christ, joined with Christ, dwelling with Christ for eternity. But Paul doesn’t stop there. We are not just heirs of God, but fellow heirs with Christ. Amazingly, we will inherit what He inherits. We are not and will we not in any sense be gods, but we will be kings, ruling under King Jesus in the eternal kingdom. I love CS Lewis’ imagery of the kings and queens of Narnia, who ruled the nation under Aslan, the Great King. This is a phenomenal expression of the Kingdom of God. God promises that we will reign with Christ as underkings and creation will finally be what God intended it to be – no more sin, no more sorrow, no more death. Just the King and the King’s children, tending the garden, but this time in glory. This is the great Christian hope! But there are two verses in the text which we haven’t yet addressed, and they bring us to our final stave. 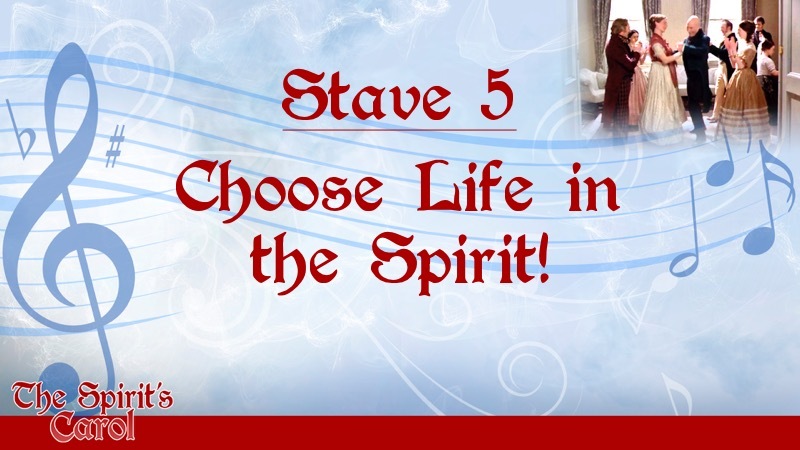 Choose Life in the Spirit! Our new lives in Christ are earned entirely by Jesus and given to us by God entirely according to His grace. But, in addition to everything we’ve discussed here, the text makes it clear that this new life requires something very significant from us as well. Look back at vv13-18. Again, I’ve truncated this a bit in the middle for the sake of brevity. If you live according to the flesh, then you will die. But if, by the Spirit, you put to death the deeds of the body, then you will live. What these verses boil down to is that you have to make a choice. Yes, God loves you and sent His Son to die for you. Yes, God then sent His Spirit to transfer you from death to life, adopt you, unite you with Christ, slowly transform you to be more like Jesus, and ultimately to resurrect you and glorify you in eternity. God did all that in His Son through the power of His Spirit. This is the Spirit’s carol. It might be easy to overthink passages like these and try to get into the mechanics of how “dying to self” or “being crucified with Christ” works. But that’s a rabbit trail. I think the best way to summarize what Paul is saying here is this that God is calling you to give up everything about your old sinful nature and choose to be transplanted. 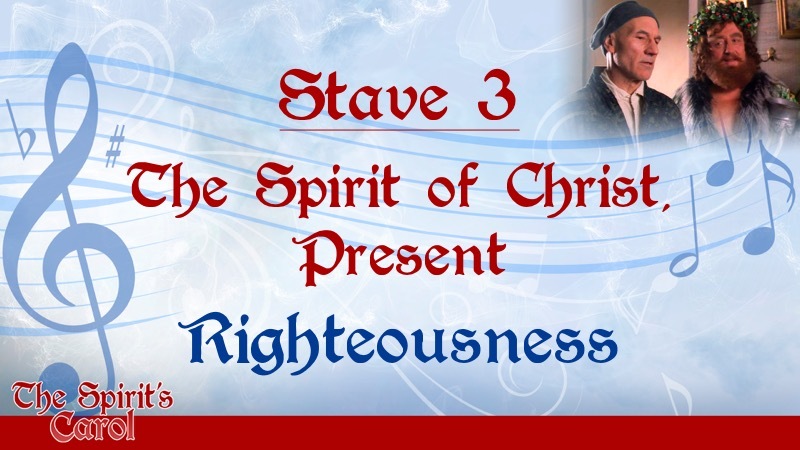 The Spirit does all the work of transplanting and indwelling and resurrecting and ensuring your inheritance. The work you have to do is willingly to be cut from the old vine. You must choose to die to one vine in order to live to another. 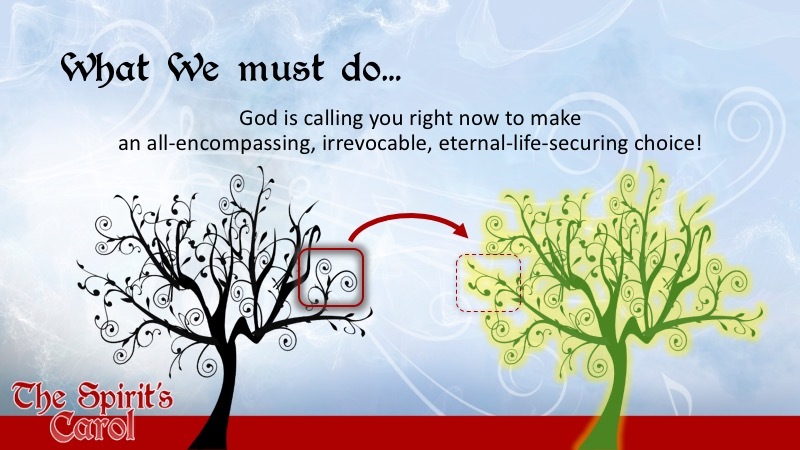 God is calling you to make an all-encompassing, irrevocable, eternal-life-securing choice. He isn’t calling you to try harder to be good or tackle some particular circumstance in your life differently. He wants you to trade all that you are – a dying branch on a withering vine planted in poisoned soil – for all that He is – abundant and eternal life. You can have one or the other, but you can’t have both. So that this time, if you already belong to the Lord Jesus, then I would ask you to pray for those who do not. And if you’re listening to me and you cannot remember a specific time in your life that you gave your heart and life to Jesus Christ, then I challenge you to choose life! Do not leave here today uncertain about this. In a second, I’m going to lead us in a prayer of surrender and commitment to God, inviting the Spirit to do what only He can do – to transfer you from death to life. And if that’s truly the desire of your heart, then pray with me, ask God, and He will do it. But I warn you, God knows your heart. This is no Disney sorcerer’s incantation to inoculate you from hell. It’s a commitment to a lifetime of surrendering your will and choosing Christ. But if you sincerely desire Him, then you can have Him right now, and tomorrow, and every day thereafter … for all eternity. Father God. I am unworthy to be called your child. I’m selfish and sinful and I have lived my life for myself. But I see now that my sin leads only to death, and I want to live. I want you more than I want anything that this world has to offer. I acknowledge that there is nothing I could do in myself to earn your love or fulfill your law, because you are a righteous and holy God. But I also know that your Son Jesus died on the cross in my place to take the penalty for my sin, and that He rose again in power to make a way for me to be born again into a new life with you. And so, on that basis alone, Lord, I am asking you to rescue me from my wicked and selfish ways, and to make me your child. Send your Spirit into my life, Father, and make me a new creation. Transplant me from death in the flesh to life by your Spirit. I surrender my life; it is no longer mine, but yours. I am crucifying with Christ all that I am, because You have promised to give me all that you are in its place. And that is better by far. Make it so, Lord, for I put my whole trust in you and in your promise of eternal life. And I know, you are faithful to do it. In Jesus’ name, I pray. Amen. If you prayed that prayer with me today, then I declare to you – in the name of the Father who is for you, and of the Son who is with you, and of the Holy Spirit is in you – that you have been born again. You are no longer dead in sin, but alive in Christ! And all of heaven is rejoicing right now, because you, a lost sinner, have come home. 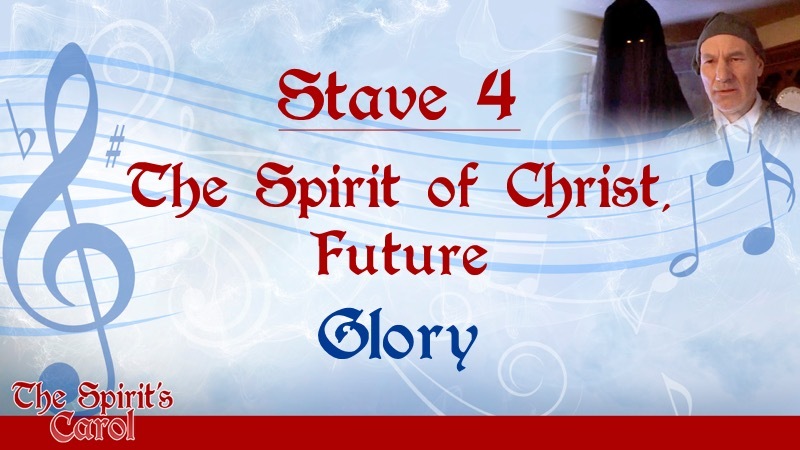 The Spirit has come upon you, and will live in you forever, changing you from the inside out, until someday you stand before God in glory in His Kingdom. And we in this church are a part of that journey. So, if you gave your life to Jesus today, please come see me after the service. I’ll be in the back by the gathering place, along with some of our elders. We’d love to meet you, and we have a gift for you to help you take the first few steps in your journey with Jesus. Also, as was mentioned in the announcements, there is a four week essentials class beginning next week during the middle hour between services. We would love to have you join us for that, where you can learn more about Jesus, ask questions, get answers, investigate the Scriptures, and develop relationships with others in the church. I hope you will avail yourself of that opportunity. And with that, I would ask the worship team to come back up. We’re going to pray, sing one more song, and then close our time together. Father, I thank you for your word, which proclaims truth and life to us. I thank you for your Spirit, who moves in us and changes us! I thank you for your love … more precious and more profound and more present than we could possibly understand. Even now there may be those in this room who are wrestling with you, struggling with the idea of laying down their lives (which are perishing) to pick up life that can never perish. Even during this song and these last few moments, Lord, would you conquer fears and idols, and declare yourself to be King over every heart within the hearing of my voice. We trust you. We submit to you. And we look to you for life itself, in the Spirit. We pray all these things in the powerful name of your Son Jesus, who lives and reigns, now and forever. 1) All slide graphics cortesy of 300dpi. 2) All movie stills courtesy of IMDB. This entry was posted in Real Life, Sermon and tagged Christmas, Holy Spirit, Kingdom of God, Redemption / The Gospel, Romans / Church at Rome, Sanctification / New Life in Christ, Spiritual Sonship / Adoption, Union with Christ. Bookmark the permalink.